The crackling fire in a traditional fireplace is a staple of Christmas cards and has become synonymous with comfort on a cold winter’s day. SoCal Fireplace Mantels is your provider for traditional fireplace mantels in Los Angeles. We have a wide selection of both traditional and modern fireplace mantels, as well as everything in between. Nothing says traditional fireplace mantel more than the smooth, classic look of marble. For centuries, marble has been the material of choice for fireplace mantels because of its intricate patterning, rich veins of color, and its ability to stay cool even when there is a roaring fire in the fireplace. SoCal Fireplace Mantels is your Los Angeles traditional fireplace mantels provider for marble fireplace mantels. We offer traditional, snow white marble, warm-toned yellow marble, dramatic maroon and white marble, peach and gray marble, and everything in between. We also carry marble fireplace mantels in a number of traditional styles, from traditional floral patterns, to flowing curved lines, traditional wreath patterns, and much more. Choose the type of marble and design that works best with your decor. In addition to marble fireplaces, SoCal Fireplace Mantels is also your provider for traditional fireplace mantels in Los Angeles for other types of stone fireplace mantels. We offer travertine fireplace mantels, sandstone fireplace mantels, cast stone fireplace mantels, and much more. Like the marble fireplace mantels, you can select the traditional design that complements the room and furnishings. SoCal Fireplace Mantels also sells precast architectural products. Whether you need a stone gazebo for your garden, a stone bench for your walkway, or even an elegant fountain for your front drive, we have what you need. If you do not see anything that you like, our design specialists can work with you to create a custom fireplace mantel or precast architectural product. We will even come out to your home to measure your fireplace or facade for your custom stone mantel or precast architectural product. 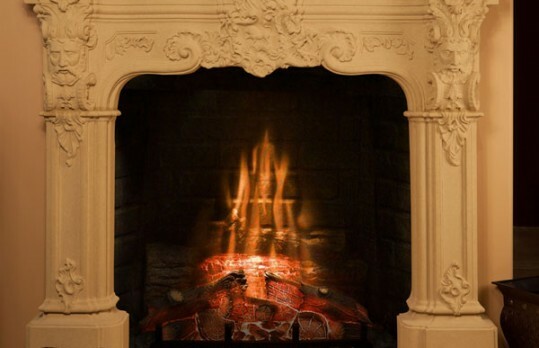 Count on SoCal Fireplace Mantels to be your premiere Los Angeles traditional fireplace mantels provider. Come visit our extensive 4000 square foot showroom in Van Nuys, or call to request a pamphlet that showcases many of our products. Whether you stop by or call for assistance, our skilled representatives are ready and waiting to assist you. We offer service in Los Angeles, Ventura County and Orange County.